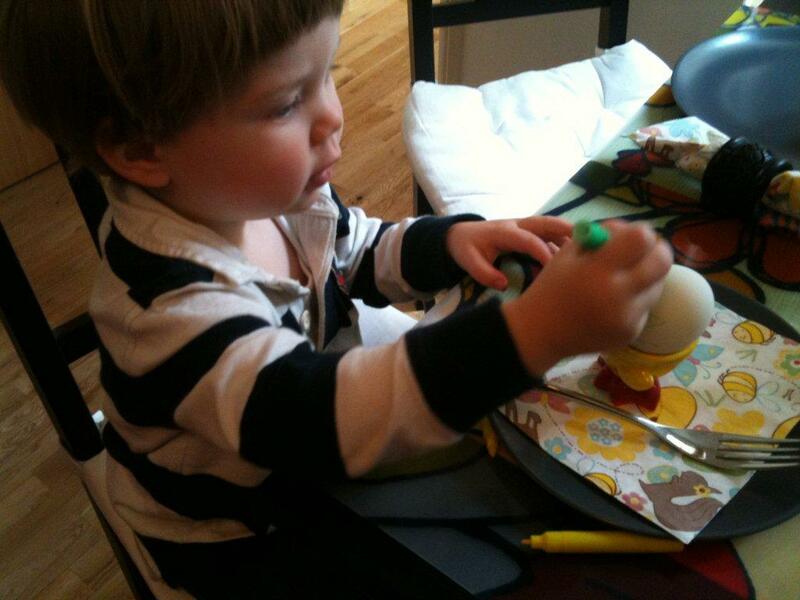 We went to visit a good Swedish friend of mine for an “early” Easter lunch last week. 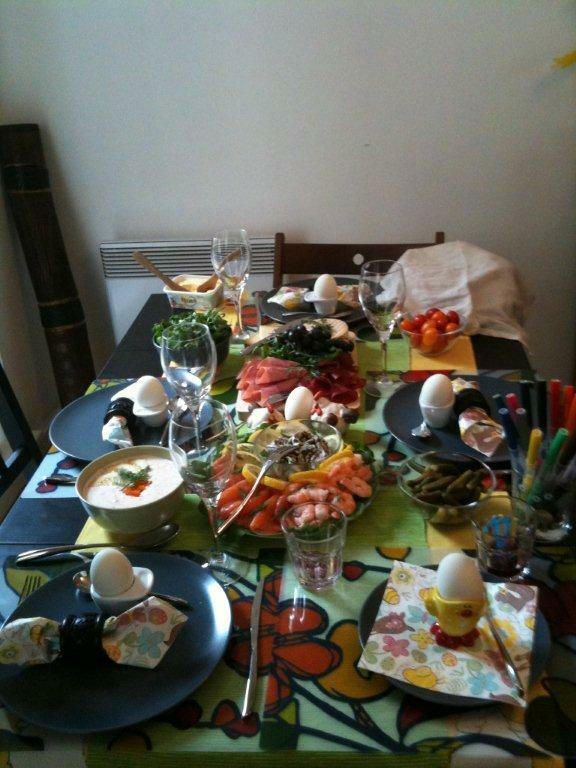 My, did she lay out a pretty spread for us – lots of Swedish traditional goodies – salmon, rollmops, meats and for Easter, of course, hard boiled eggs. 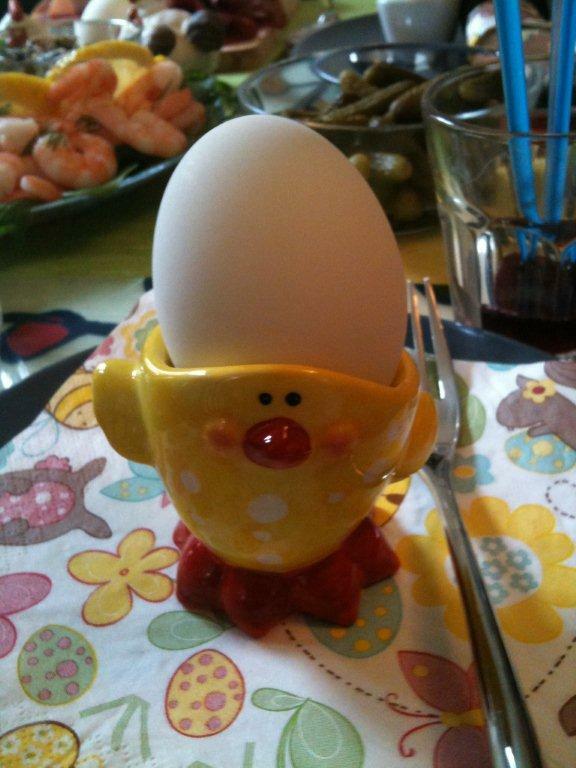 Like in most countries that decorate eggs, you usually decorate them before the lunch. However, my friend decided it would be more fun for us all to have a go as we sat down to eat. Much more fun. Here are some photos. It is hard to find white eggs in the Uk, so we used duck eggs. They were very tasty! Friend’s take on day: I am still laughing when I think about Max catching grapes: Are you ready? Yeah! Are you going to catch it? Yeah! Are you sure? Yeah! Really? Yeah! Hi hi hi! (you had to be there, Red Ted “trying” to catch grapes in his 2yrs old mouth!). After we had stuffed ourselves (we also were served a traditioal chocolate cake, delicious), we got crafty and made a vlog on how to make Swedisch hearts. These are traditional for Christmas, but I think you could easily use them whenever. 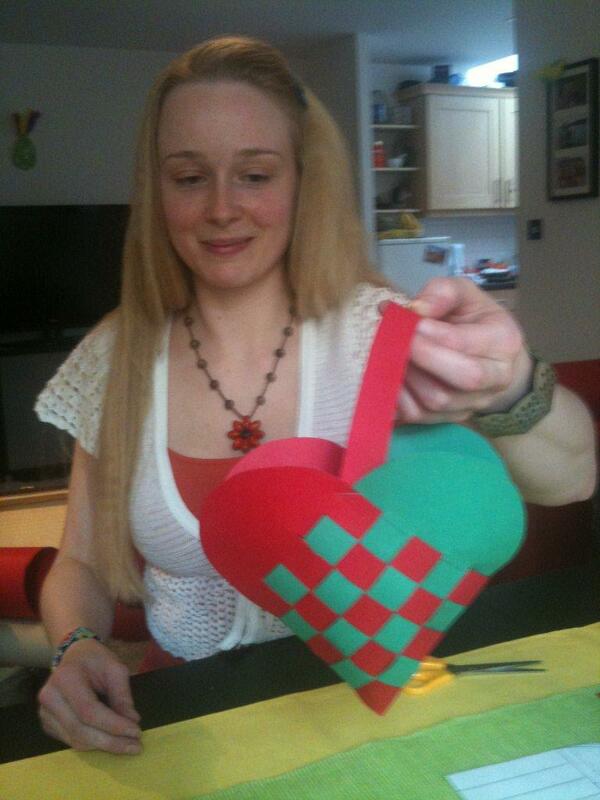 If you find the “basket” idea to fiddly – you can always make a “1-dimensional heart” and glueing the ends down (i.e. ignore the fact that you have “loops”). These still make for pretty decorations – you just can’t fill them! You will need: Paper 2 contrasting colours, template, scissors, stapler. If you make your own template, ruler & pencil. That is super fab and definitely going in my ‘to do with Kyra’ folder – in a few years, of course! Oh yes! It was a gorgeous lunch! And DO have a go… rememeber: the bottom needs to be a square, divided up equally with a semi circle (ish) on top!! The results are SO worth it! Enjoy!!!! Wow, these are AMAZING; my boys get a bit squeamish about ‘girly’ hearts these days (good grief, and I thought I was raising them as feminists), so will try an alternative shape (any ideas? ), but they are brilliant – good work! Could do one half with a dinosaur head and arm. The other half with a big dinosaur tail? That could look cool?? Maybe…???????? Oh my crafty goodness! My mother has one of these that a visiting Finn made for her years ago. I recently spent ages trying to figure out how to recreate it, to no avail. I cannot tell you how excited I am to find this here! Now I just need to get myself to a high-speed connection so that I can actually *watch* the video. Ooooh am so pleased! You are one my Craft Gurus! So am pleased, I was able to “to give you something” in return! Hurray!!! !